SHOWN WITH 316 C-7 INCANDESCENT GREEN & BLUE LAMPS. COMPLETE WITH STANDARD GROUND MOUNT HARDWARE. 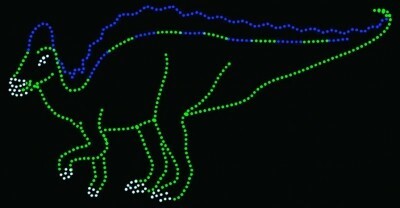 9' x 19' ANIMATED HYPACROSAURUS HAS 424 C-7 INCANDESCENT LAMPS @ 2,120 WATTS & 270 LBS. ALSO AVAILABLE 12' x 26' HYPACROSAURUS: STATIC HAS 418 C-7 INCANDESCENT LAMPS @ 2,090 WATTS & 265 LBS. ANIMATED HAS 565 C-7 INCANDESCENT LAMPS @ 2,825 WATTS & 265 LBS.